Tom Clancy’s Jack Ryan series never really turned into a megahit franchise, but after four movies spread over 12 years, it certainly has proven to enjoy a good level of success. Actually, the chronology is somewhat deceptive. The first three flicks came out from 1990 to 1994, but the fourth didn’t hit screens until eight years after that. Even with such a substantial break, the latest iteration – 2002’s The Sum of All Fears - found a reasonable audience and showed that old Jack (or young Jack, in this case) still had legs. 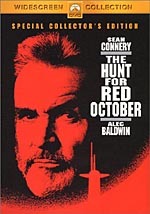 The first adaptation in the series, 1990’s The Hunt For Red October probably remains the most popular of the bunch. Set in 1984, we meet Ryan (Alec Baldwin), a bookish analyst for the CIA. He meets with his boss, Admiral Greer (James Earl Jones) after he checks out some surveillance pictures of a new Soviet sub. He sees some suspicious doors and wants to find out what’s up with this new model. I think that appearance is due mainly to the large roster of characters and the convoluted plotting more than anything else. Plus, when Connery's around, everyone else has to take a back seat. That's not to imply he's a "film hog”. I mean simply that he's such a dominating presence that just having him around will almost automatically diminish the status of others. While the remaster generally improved upon the old one, it introduced a few concerns of its own. Sharpness became one of these. The prior disc looked consistently crisp, though to an excess; it suffered from heavy examples of jagged lines and shimmering. The reissue eliminated those issues, but it also seemed a bit ill defined at times. The movie generally looked reasonably detailed and accurate, but some shots demonstrated mild softness that didn’t appear evident on the original DVD. While the special edition lost the jaggies and moiré effects, it also seemed to add a little edge enhancement that I didn’t notice during the old disc. The haloes never looked heavy, but they occasionally created some distractions. One major issue with the original disc also largely cleared up here. The special edition presented occasional examples of grit and speckles, and these appeared periodically through the movie. I also noticed a little more grain than I’d expect. However, these concerns didn’t cause nearly as many problems during the special edition as in the original disc. The new one cleaned up the presentation to a considerable degree. Unfortunately, colors appeared to fare less well during the special edition. The hues looked brighter and more vibrant during the original disc. Here the tones came across as reasonably distinct much of the time, but they didn’t stand out like they had on the previous release. Perhaps that one jacked up the levels to pop more than the director intended, but I found the prior disc’s colors to seem more lively and satisfying. Similar issues related to black levels and low-light shots. On the special edition, those elements came across as moderately drab and bland at times. Blacks generally seemed fairly deep and strong, but the movie suffered from a brownish tint at times, and that affected the shadows. The movie included many low-light sequences – especially on the subs – and these appeared mildly flat and listless. These shots came across as better defined on the prior disc. When I compared the two, I preferred the special edition’s image simply because the flaws of the original seemed so hard to ignore. Between the print flaws and the jags, the old picture often seemed like something of a mess. While the special edition cleaned up those problems, it suffered from some new ones that made it less satisfying than I might have anticipated. I thought it worked better and it was good enough for me to bump my grade to a “B-“, but don’t expect a stellar image from this new version of Red October. While I ran into some problems with the visuals, the audio of The Hunt For Red October seemed substantially more satisfying. The DVD included both Dolby Digital 5.1 and DTS 5.1 soundtracks. This marked Paramount’s first use of DTS, so I wish I could say that it seemed like a substantial improvement over the Dolby mix. Unfortunately, it didn’t. I thought bass appeared marginally stronger for the DTS version, but overall, the pair sounded virtually identical. Nonetheless, I can’t complain, for the mixes were both terrific. The soundfield showed a consistently positive sense of environment. The forward channels mildly dominated the piece, and they presented excellent delineation and separation. The front speakers remained in use through the majority of the movie, and they created a setting that was lively and realistic. Elements blended smoothly, and pieces moved cleanly across the channels. The surrounds appeared significantly more active than I expected for a film of this era. They presented lots of excellent material for both quiet and loud sequences. In one early shot, whale sounds emanated convincingly from the right rear speaker, and the channels neatly communicated the sense of being underwater during the many sub shots. The action scenes brought the surrounds to life as well, and other segments – like one in a shipyard – used all five channels with great effectiveness. Overall, the soundfield worked tremendously well to create an immersive environment. Audio didn’t seem quite as strong, at least in regard to dialogue. Speech periodically sounded somewhat flat and lifeless; they came across as a little too bass-heavy. I never found it tough to understand the lines, but they stood out as mildly weak compared to the rest of the track. Music appeared vivid and dynamic and showed nice depth and punch. Effects seemed really positive. They displayed no signs of distortion and they powered through the various scenes with great clarity and richness. Bass response was tight and distinctive throughout the movie, and the track gave my subwoofer more of a workout than I anticipated. The moderately problematic quality of the speech almost knocked my grade down to a “B+”, but given the age of the material and the high caliber of all other elements, I felt October deserved an “A-“; this was a very strong auditory effort. Paramount’s special edition release of The Hunt For Red October adds some new materials not found on the old DVD. We still find the movie’s theatrical trailer, presented non-anamorphic 2.35:1 with Dolby Digital 5.1 audio. For the new stuff, we start with an audio commentary from director John McTiernan, who provided a running, screen-specific piece. This was the fourth McTiernan track I’ve heard, but only the second that put him on his own. McTiernan has never seemed terribly at home with the format, and those concerns continued during his dull discussion of October. McTiernan covered a mix of topics. He went into changes from the book, casting, issues related to factual matters, different forms of research, storytelling concerns, and some technical matters related to effects, locations, and other areas. That quick synopsis might make the commentary sound more informative than it actually was. Frankly, McTiernan’s useful remarks occurred infrequently. Actually, any form of information cropped up only occasionally, as much of the track passed without discussion. The facts appeared in dribs and drabs, and McTiernan often didn’t explore them well. For example, at one point he mentioned his original plan to cast an actor who physically resembled Joss Ackland to play against him in the part eventually garnered by Richard Jordan. Why didn’t this happen? I don’t know, for McTiernan let the subject drop without additional explanation. The director offered periodic bits of decent information, but overall, this commentary seemed fairly boring and slow-paced. In addition, we find a new documentary called Beneath the Surface. This 28-minute and 57-second program featured the standard mix of movie clips, production materials, and interviews. We got new chats with producer Mace Neufeld, director John McTiernan, actors Alec Baldwin, James Earl Jones, and Scott Glenn, screenwriter Larry Ferguson, director of photography Jan de Bont, ILM visual effects supervisor Scott Squires, ILM model shop manager Keith London, ILM chief model maker Kim Smith, ILM first assistant cameramen Bob Hill and Vance Piper, ILM directors of photography Marty Rosenberg, Patrick Sweeney, and Carl Miller, and ILM technical director Doug Smythe. In addition, Sean Connery appeared via pieces shot in 1990. The participants started at the beginning and discussed the acquisition of the rights to Clancy’s novel and various adaptation issues. They then went into casting, research for the roles, and many technical topics related to the subs and other special effects concerns. Like many Paramount features of this sort, “Surface” conveyed the information well but lacked much flair. It included a reasonable amount of material and certainly gave us more insight into the production than did McTiernan’s commentary, but it came across as a little plodding at times. Still, at least it presented useful material, so October fans will want to give it a look. ”Credit where credit is due” footnote: as usual, Paramount provided subtitles for the documentary. Here we found text in English, Spanish and French. Oh, and the movie maintained its original “burned in” subtitles for Russian dialogue. Many DVDs go for player-generated text instead, so I was happy to see that Paramount didn’t tamper with this. Though I didn’t think much of The Hunt For Red October when I first saw it in 1990, I must admit it’s slowly grown on me over the years. It crams in a lot of technical issues and conveys them concisely, and it builds to a rousing and involving climax. The newly-remastered picture showed moderately superior visuals when compared to the prior release, whereas the audio seemed to remain the same between the two. The special edition added a small roster of extras that had some good moments but didn’t appear to be consistently above average. For folks who don’t own any DVD version of The Hunt For Red October, I can definitely recommend this new special edition. It didn’t improve picture and extras as much as I expected, but it still demonstrated growth, so the SE becomes the one to get. The matter complicates when I consider whether those who possess the old disc should trade it in for the new one. Frankly, that will depend on how much you like the movie. Big fans should want to get the special edition, but people with less intensive interest may feel content with the old one. The re-release definitely provides the superior package, but it didn’t improve things enough to warrant a strong recommendation for an upgrade.